Why Robin Lopez, Mike D'Antoni, and a game played on beaches should change the way we discuss fit — and sports in general. It took one day for us to tell that Robin Lopez was different. It was early September. The summer had faded, and, along with the Portland rain, the Blazers veterans had started to return. They would play pickup at the practice facility each day to ramp up their conditioning for training camp, going half-speed until the game got close. But when Robin joined the fray, the whole atmosphere changed. He played hard the whole time. He set crushing screens, walled off the rim, boxed out, and cleaned the offensive glass. It was exactly what we had been missing the prior year. The 2012-13 season had been better than expected — at the start of February we were 23-23 and only a game out of the playoffs before fading down the stretch — but had shown a glaring weakness: we needed a true center. We allowed the third most shots at the rim and had the 22nd ranked FG% defense around the basket. The core of a good team was there, with Damian Lillard, Wesley Matthews, Nic Batum, and LaMarcus Aldridge forming a formidable foursome. But starting JJ Hickson in the middle wasn’t going to cut it. Enter the artist also known as RoLo. We acquired Lopez during the 2013 offseason. Blazers’ General Manager Neil Olshey had spent all of July 4th on the phone, convincing New Orleans this was the perfect way to facilitate their sign-and-trade acquisition of Tyreke Evans. There were moments when it looked like the deal might fall apart. But by the time the smoke from the fireworks and barbecues had cleared, we had our new center. We were optimistic, but cautiously so. Lopez was not a proven defensive game-changer. The year before, with Lopez starting at center, New Orleans ranked 28th on defense. But we were overhauling our defensive schemes and Lopez perfectly fit the profile we were looking for: a big man to play back, guard the rim using principles of verticality, and box out. What was difficult to foresee, though, was just how much Lopez would mean to the team off the court. “We knew basketball-wise it was a fit,” says Coach Terry Stotts. “But we didn’t know the chemistry would be that good as well.” At his introductory press conference, RoLo was asked his thoughts on coming to Portland. “It’s my kind of place. I think I’ll fit in here,” he said. “It feels like kismet.” He was referring to his fit in the hipster-infested, always-weird culture of the city, but he might as well have been talking about his fit on the team. Fit is a funny word to use for Lopez, because he is not your typical NBA personality. (I mean, for starters, how many players have used the word “kismet” in an NBA press conference?) He loves Disney, comic books, and art — on one road trip he rushed into a film session a few moments before it was due to start with his shoes off, carrying them in his hand. As he sat down near me I got a look: he had drawn an elaborate, maze-like pattern all over his sneakers with sharpie, an intricate and detailed design taking quite a bit of talent. He once described himself as the Screech Powers (from the television show Saved by the Bell) of the NBA. “But Screech is the quintessential nerd — you think you’re a nerd?” an interviewer once asked him. “Oh yeah, I’m not denying it,” Robin responded. To protect his back from the pain he experienced early in his career, Lopez liked to lie down instead of sit whenever possible. He’d even do this on our flights, all 7-feet of him stretched out, covering the entire width of the plane, unperturbed by the flight attendants carefully stepping over him as they went about their duties. His ongoing mascot feud is a gag few other athletes could pull off with so little pretentiousness and so much humor. This lack of self-absorption and genuine nature is a large part of what made him so likable. There was one day I was working in our glass-walled conference room, which sat right at the entrance to the practice facility, as the players made their way out of practice. RoLo was on his way out but stopped suddenly at the door and gave me an exasperated look. “What’s going on?” I asked with some concern. I laughed and shook my head. Apparently NBA players have the same problems as the rest of us — but Robin is one of the few who would admit it. A lack of ego is appreciated by coworkers in any industry, but there is perhaps nowhere that quality is more valuable than in an NBA locker room, where heads swell to such sizes that there’s scarcely room for the equipment. In a space like that, a personality like Robin Lopez’s can be what makes it all work. He was never afraid to laugh at himself or make a joke at his own expense in a film session. He was always happiest for his teammates’ success. That played out on the court as well: Lopez is one of the kings of the box out, assiduously sealing off his own man, content to let a teammate collect the valuable stat.1 It’s not a coincidence that the two best rebounding years of LaMarcus Aldridge’s career occurred playing alongside Lopez. The only major roster difference between the 33-49 outfit from 2012-13 and the 54 win team of 2013-14 was Robin Lopez. Looking back, there may have been no more flawless fit for our team, both on and off the court. Kismet indeed. If you were to ask what the cause of that sudden surge was, the reason why a team that was picked before the year to finish below .500 ended up spending significant time at the top of the conference, you wouldn’t be wrong in saying simply: “Robin Lopez.” But you also wouldn’t be right. In the summer of 2016, I regarded the Houston Rockets’ moves with some puzzlement. In the four years since acquiring James Harden, the Rockets had taken on the qualities of their star: on average they ranked 7th on offense but 16th on defense. They seemed to have scoring mostly figured out: they were all about free throws, layups and threes, played heavily in transition, and had relatively simple offensive sets that worked by relying on their stars and spacing. It seemed clear that defense was the place to look to improve the team, with a coaching vacancy providing the first opportunity. Instead, they hired Mike D’Antoni. D’Antoni is unfairly maligned for his defensive coaching: in his four full seasons as head coach of the Suns, D’Antoni’s teams ranked between 14th and 16th on defense. Not great, but not the disaster on that end that critics claimed. His reputation as a bad defensive coach seems mainly to come from pushing the pace to an extreme in an era where there was still not a widespread understanding of the value of per-possession stats. Still, it’s safe to say that defense is not his priority. In his eight full seasons as a head coach he has not once coached a team that was better on defense than they were on offense, and, until this 2017-18 season, he had never coached a team that rated significantly above average on defense. You don’t hire Mike D’Antoni to fix your defense. You don’t sign Ryan Anderson, a marksman with a consistent track record as one of the worst defensive big men in the NBA, to a hefty contract. Ditto for Eric Gordon, a talented scorer who had had his struggles defensively. No, the Rockets weren’t looking to shore up a leaky defense. They were betting it all on their offense. And I thought that was a mistake. I was wrong, of course. Very wrong. Those players ended up fitting perfectly on offense, with only Golden State’s historic offense eclipsing the Rockets’ last year. And utilizing a clever scheme designed by assistant coach Jeff Bzdelik, Houston’s defense wasn’t as bad as might be expected, finishing the year 16th. That turned the Rockets into a 55 win team — and one intriguing enough to be Chris Paul’s offseason destination of choice. Along with Paul, last summer the Rockets brought in PJ Tucker and Luc Mbah a Moute: two smart, switchable players who have helped catapult the team to its current lofty defensive mark without sacrificing much on the offensive end. And here we are, with Mike D’Antoni on pace to coach his first top 10 defense, and the Rockets posing a legitimate threat to the Golden State juggernaut. But the Rockets’ rise isn’t just about D’Antoni. Nor is it just about James Harden, or just about Chris Paul, or just about Ryan Anderson, Eric Gordon, Luc Mbah a Moute, or PJ Tucker. Take the 21 Nash play I dissected in last week’s Friday Film. As I detailed, it’s an elegant design. But it’s so deadly because of the combination of the Xs and Os and the players involved: James Harden or Chris Paul or Eric Gordon running a pick-and-roll with a spaced floor and a real threat as a roller doesn’t require any special set, but this set makes great use of those players. Mike D’Antoni didn’t look like an offensive genius when he was in New York with Chris Duhon running the point, or in LA with Dwight and Pau clogging up the interior. And while Steve Nash was very good in Dallas, he wasn’t an MVP until he got to Phoenix and played for D’Antoni. Amar’e Stoudemire, meanwhile, benefited from the presence of both of them — and by forcing defenses to adjust to his explosive rolls to the rim made both of them look better. Those Seven Seconds or Less Suns didn’t just combine in what mathematicians would call a linear fashion, where D’Antoni + Nash + Amar’e + Shawn Marion = the Suns. They represented the principle of gestalt: their whole was greater than the sum of their parts. This is the beauty of basketball: players and coaches aren’t just interchangeable pieces. Fit matters. When the pieces click, it can create something incredible and lasting — a team like the 1970s Knicks is still held up as an example of just this idea of gestalt on the court. In 2009 Dean Oliver and Mike Fienan published a paper in the Journal of Quantitative Analysis of Sport titled Importance of Teammate Fit: Frescoball Example. Their clever use of frescoball, a paddle game played on beaches worldwide, lays bare the concept of fit and the challenges we have analyzing any combinations of players — both quantitatively and qualitatively. Frescoball is a collaborative sport: two players stand with paddles 15-30 feet apart and try to bat a ball back and forth as many times as possible without it hitting the ground. Dean and Mike proposed a way to classify players that was simple and easily understood, but still managed to capture the idea of fit. They looked at two attributes: athleticism and consistency. Athletic players are good at returning a ball hit outside their sweet spot to the other player’s sweet spot. Consistent players are good at returning a ball hit in their sweet spot to the other player’s sweet spot. They then randomly assigned these abilities to players, randomly paired them up, and simulated seasons of frescoball play. What they found surprised them. A dominant team emerged, a team that put up incredible numbers, but didn’t have the prototypically athletic frescoball players. Were this a real sports league, other teams would look at this dominant team and try very hard, perhaps spending ungodly sums of money, to acquire one of the two parts of this great team. And they would be making a huge mistake, a mistake that occurs often in professional sports. Causality itself is a conceptual tool that simplifies, schematizes, and focuses our representation of situations. This cognitive machinery guides us to think in terms of the cause — of an outcome’s having a single cause. Yet for enlarged understanding, it is more accurate to represent outcomes as caused by an intersection, or nexus, of factors. We are wired to believe B causes A. Our brains are not built to comprehend a world where B, C, D, E, and F all combine in some unique way to cause A. Nor are our statistical methods well designed to capture this sort of complexity. And basketball, like life, does not lend itself to easy explanations. Even when we know what happened, it’s very difficult to look back and disentangle all of the threads that led to the result. Yet our discourse and our analytical methods do not reflect that. We still search for one or two clear causes for success and failure. We still create statistical models that evaluate players as if they play in a vacuum and not in a team. We still react to results instead of attempting to understand the process that led to them. 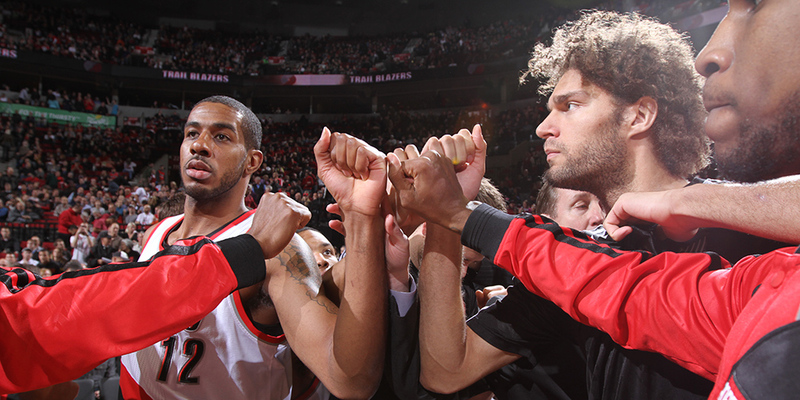 After two 50-win seasons in Portland, Robin Lopez’s teams haven’t been above .500 since. Lopez can’t single-handedly bring a team good chemistry, or redefine a defense. He happened to fit perfectly into that Blazers’ squad. The combination of Lopez with his teammates, with our coaching staff, with uncommon health, and with a thousand other factors big and small, took our team to a level that nobody anticipated. Lopez was certainly a cause of our success. But he was not the cause. He was just part of the nexus.